Summary: Lillia, Kat, and Mary had the perfect plan. Work together in secret to take down the people who wronged them. But things didn’t exactly go the way they’d hoped at the Homecoming Dance. Not even close. For now, it looks like they got away with it. All they have to do is move on and pick up the pieces, forget there ever was a pact. But it’s not easy, not when Reeve is still a total jerk and Rennie’s meaner than she ever was before. Review: The Burn for Burn series is the sort of series that people would call a ‘guilty pleasure’ — though why anyone should feel guilty about reading something that makes them happy is beyond me. Fire with Fire is the second book in the Burn for Burn series. The first book involves the three main girls (Lillia, Kat and Mary) getting their respective vengeance on those who have wronged them. It’s probably best to read the first book to follow what’s going on in the second, but it’s not strictly necessary for enjoying the sequel. The second book, Fire with Fire (a brilliant title! ), follows in the wake of Burn for Burn after the girls have gotten their revenge. Instead of being satisfied, the girls are determined to follow through and get revenge on the one guy who hurt Mary. Of course, the revenge plot does not go as planned. The constantly shifting relationships create a lot of compelling drama and conflict, which is at once Fire with Fire’s strength and weakness. 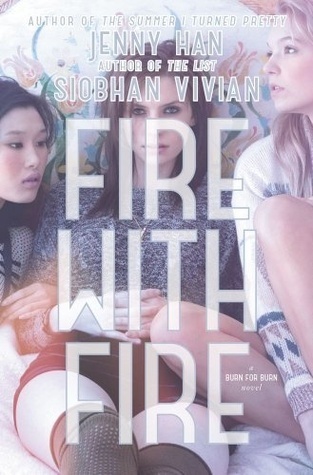 Fire with Fire takes place in the same alternate universe as many tv shows and YA books — you know, that bizarre alternate universe in which every girl is rich/cool/beautiful and the only clique that matters is the popular crowd. The romantic conflict, while highly emotional and interesting to read, definitely threw me. I just can’t get behind any romance that even vaguely follows the path of Irredeemable Hot Jerk Gets Redeemed. More forgiving and romantic readers would definitely disagree with me on this point — so if you like it, read it. The high drama tone of the series felt heavy handed at times, but what sets the series apart from others is the development of the girls’ friendships and the tinge of the supernatural that creeps in from time to time. Crazy plot twists are this series’ strong point and it only gets better in the second book. Unfortunately, the foundation for these plot twists isn’t laid out clearly, so it’s a little jarring. If you enjoy revenge and romance in the alternate universe setting where everyone is beautiful and cool, then this book will be a pleasure to read. Recommendation: Borrow it someday if you want a dose of revenge and romance.